According to the Centers for Disease Control and Prevention, approximately 43.8 million people (18 years or older), in the United States smoke cigarettes. What’s even more astounding is that cigarette smoking is the leading cause of preventable death in the United States. Every year in the United States more than 440,000 deaths occur. Smoking causes cancer, heart disease, stroke, and lung diseases (including emphysema, bronchitis, and chronic airway obstruction). More than half of all adult smokers have quit, and millions of people have learned to face life without a cigarette, and you can too. What’s so exciting is that you don’t have to do it alone. You can find valuable information in real time by taking part in the The Great American Smokeout Twitter Chat presented by Sharecare. The experts from the American Cancer Society and Sharecare will answer your questions and provide you with resources to help you. Quit smoking for good with live help from the American Cancer Society. Where: Right here! And on Twitter! Ask your questions in advance on November 20! Have a question about how to quit smoking? Just starting to quit and need tips and tricks? Wondering about ways to improve your health once you quit? Want to know how lawmakers can help in the fight against tobacco use? 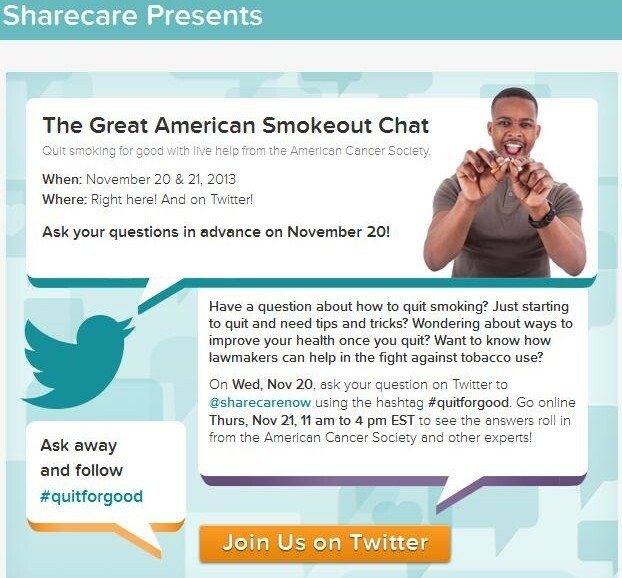 On Wednesday, November 20, ask your question on Twitter to @sharecarenow using the Hashtag #quitforgood. Go online Thursday, November 21, 11 am to 4 pm EST to see the answers roll in from the American Cancer Society and other experts! Ask away and follow #quitforgood – I’m thrilled to participate in Sharecare’s Twitter Chat. Start asking your questions now. 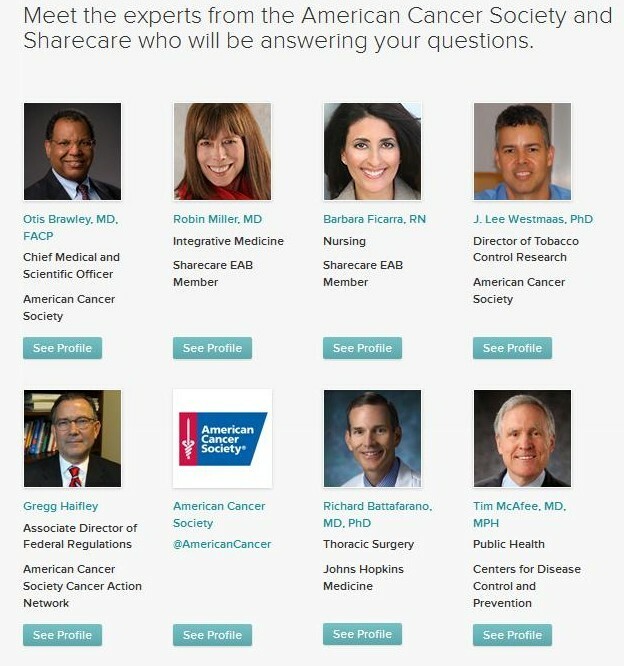 More information on the Sharecare Twitter Chat may be found here. « Are Doctors Writing Prescriptions for Fruits and Vegetables?